Jill is passionate about family law and fighting for the interests of her clients. Jill believes that advocating for the parent and helping the party through one of the most difficult times in his or her life can help all parties involved to learn to co-parent and adopt tools to manage the change and move forward as a family. She understands that every case is different and gives each client the individual attention that he or she deserves while going through what can often be a difficult process. Jill received her undergraduate degree in Political Science from Missouri Southern State University. While attending Missouri Southern, Jill was active in the honors program and a member of Pi Sigma Alpha, the political science honors fraternity. Jill had the opportunity to intern in the Missouri State Senate and was recognized with a Senate Resolution at the end of her internship. Upon graduation from Missouri Southern, Jill attended and completed her law degree at Oklahoma City University, School of Law. During law school she was a recipient of the Dean’s Public Interest Fellowship and had the opportunity to work in the Oklahoma County Public Defender’s Office in the Juvenile Division. During that time, she worked with children and their families when the children were facing criminal charges. She also worked with families involved in abuse and neglect cases. Her role was to help both the juveniles and their parents understand charges that were pending and the process of the court system. 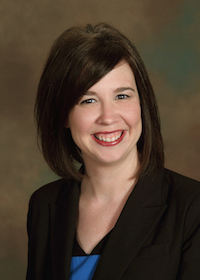 Following her graduation from Oklahoma City University and passing the Oklahoma Bar Exam, Jill had begun working for Father’s Parental Rights Law Center in Oklahoma City. While there, she handled all aspects of a family law cases. The firm did have a focus on father’s rights, but represented mothers and fathers in highly contentious custody cases. While at Father’s Parental Rights Law Center, Jill also represented individuals in criminal cases related to their family law matters. Jill has practiced primarily in family law since receiving her Juris Doctorate from Oklahoma City University School of Law. She is licensed to practice law in Oklahoma and Missouri. She also has extensive experience in juvenile law including abuse and neglect cases. Her extensive experience with family law cases includes representing the client in all aspects of the case from the initial consultation, drafting motions, conducting discovery, appearing at hearings, and fighting for the client at trial. Through law school and in practice, Jill has been a part of a wide range of family law cases from non-contested to those facing complex issues of custody, business, or domestic violence. Jill grew up in southwest Missouri and after practicing law in Oklahoma City, relocated to St. Charles with her husband in 2014. After the move to Missouri and passing the Missouri Bar Exam, Jill joined The Bellon Law Group in 2015. In her spare time she enjoys spending time with her husband and their two dogs, reading, finding new restaurants in St. Charles and St. Louis, watching movies, and cheering on the St. Louis Cardinals and Kansas City Chiefs.